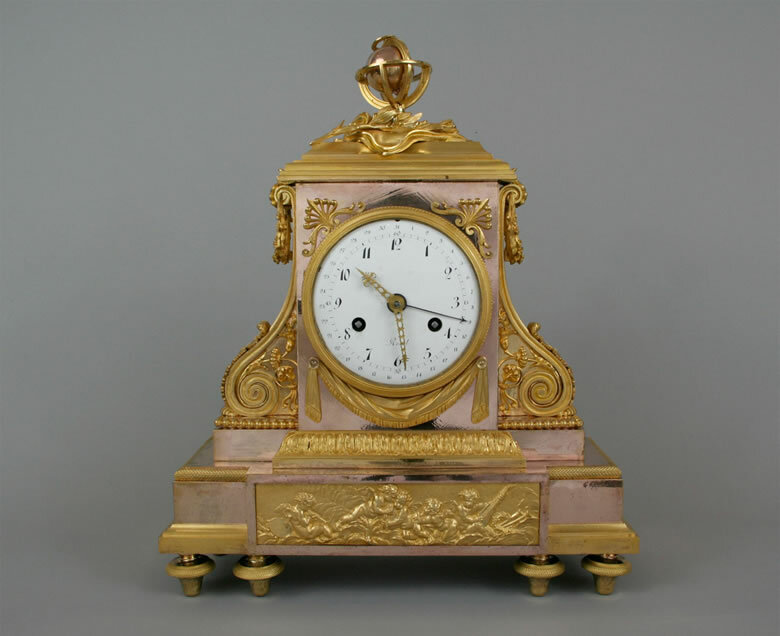 Very fine Louis XVI mantel clock with exceptional two-colored gilding. Two large volutes flank the clock face, which is surmounted by a globe. A relief depicting putti playing musical instruments is below. The pink gilding on the body of the clock is burnished to a brilliant mirror-like finish: the yellow gilded pieces are in a matte finish. Another model, identical, except with a figure of Cupid replacing the globe, is found in the Spanish Royal Collections. See : J. Ramon Colon De Carvajal; Catàlogo de Relojes del Patrimonio Nacional ; Nº 50.